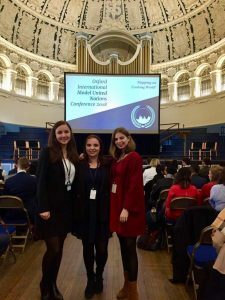 In October 2018 we sent a delegation of three to Oxford University, one of the oldest universities in the world, to attend OxiMUN. Winona represented Bangladesh in the Belt and Road Initiative (BFR) while Katja joined the UN Women as Japan. Our newcomer Paulina gained her first MUN experience in the SOCHUM representing Australia. 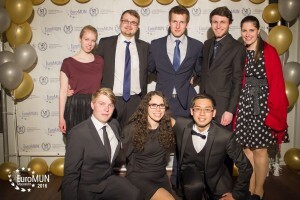 We are very proud of them and want to congratulate Katja for winning a Commendation Award in her committee. 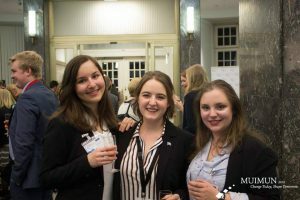 Katja, Teresa and Wiona visited the beautiful city of Münster for the MuiMUN 2018. Katja represented France in the UNEP, while Winona joined the ECOSOC as Rwanda and Teresa chaired the Spanish speaking committee CEPAL. We are very proud of them and are looking forward to interesting stories from the conference. 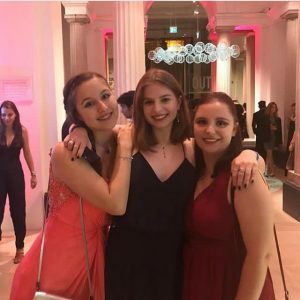 This year we sent our first delegation to a Spanish MUN Conference. 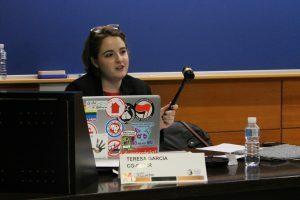 Teresa and the first timer Kim went to Madrid from the 5th to the 9th of March to participate in the UC3MUN at the Universidad Carlos III in the Spanish Capital. While Teresa co-chaired the UN WOMEN, Kim represented Kuwait in the same committee. The topics discussed were Women’s Role in Ending Violence And Sustaining Peace and Glass Ceilings in Women's Career Development. Both of them enjoyed the conference immensely and had interesting stories to tell! 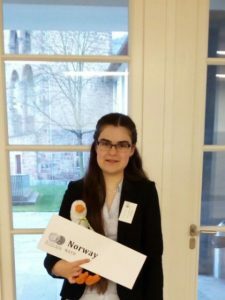 On the second weekend of the New Year our MUN veteran Tabea attended the 8th Heidelberg National MUN conference. She represented Norway in the NATO, where she discussed the future of NATO. 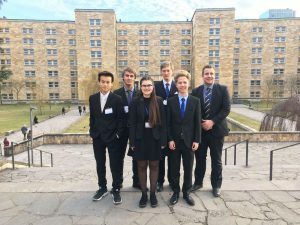 A delegation of seven participated in the 2017 HamMUN conference from 30th of November to the 3rd of December. Our delegation was represented by Teresa, Thuy and Sebastian S. in the AU who debated as Nigeria, Liberia and Ethopia. Furthermore, Philipp and our newcomer Sebastian B. represented Hamburg and Bremen in the Hanseatic League that was simulated in the Historical Crisis Council. While Winona negotiated as Cuba in the UNHRC, Iris served as the delegate of Paraguay in the IAEA. 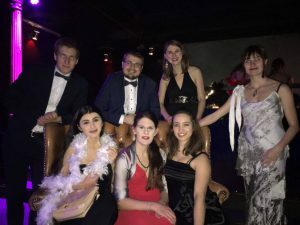 Our experienced member Tabea visited Karlsruhe and the Karlsruhe Institute of Technology during the annual KaMUN 2017 from November 17th to 19th. She joined the Security Council where she debated the Civil War in Yemen and the Migration Crisis in Latin America. 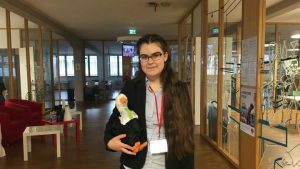 You can see her here with our society's mascot Günther the Goose. We are very proud of her and are looking forward to hearing her stories! 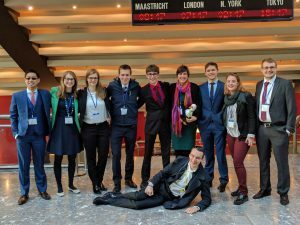 We were enjoying 4 beautiful days in Maastricht participating in EuroMUN 2017. Ingo and Imme joined the NATO as Lithuania and Estonia while Merle represented Italy in the WHO. In the Eurogroup were “debt restructuring programs for any indebted Eurogroup country” was discussed Duc joined also as Estonia and Paulina as Finland. MUNSG was represented at the conference by Artur, Sven and Philipp in the Historical Committee negotiating the Maastricht Treaty. Last but not least Teresa was busy in the European Parliament as Georgios Epitideios from Greece. 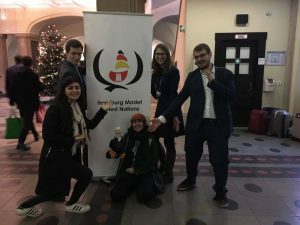 Paulina, Anne, Sophie, Teresa, Iris and Artur have visited MuiMUN 2017 in the beautiful city of Münster. They worked in the League of Nations, ECOFIN and UNEP to achieve equality. We are very proud of all of you and especially our first timers! 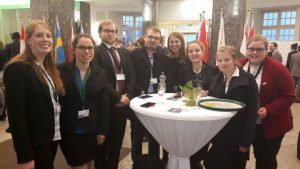 Tabea visited Franfurt am Main and the Goethe University Frankfurt during the annual MainMUN 2017 from February 23th to 26th to represent France in the Security Council. You can see her here with other Representatives of France in different councils. A delegation of five participated in the 2016 HamMUN conference from 1st of December till 4th. With us we had two newcomers and MUN first-timers Isabelle and Diana. Furthermore our more experienced members Paulina, Sven and Artur joined the delegation. We are very proud of their achievements and are looing forward to hearing their fun stories. 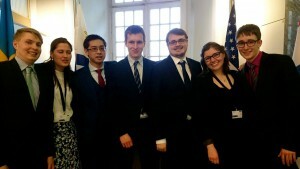 MUNSG sent seven of our best people to join SMUN from November 10th to 13th in Stockholm. Thanks to Merle, Larissa, Charlotte, Ingo, Philipp, Sven and Artur for dedicating our time and effort. 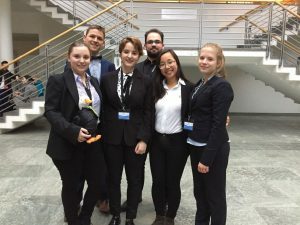 And congratulations from all of us, especially to Sven for winning the Best Delegate Award and to Philipp a first-timer for winning the Honorable Mention Award. 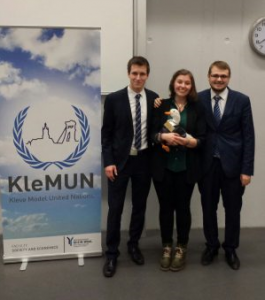 Doreen, Sven and Artur visited Kleve and the Rhine-Waal University of Applied Sciences during the annual KleMUN 2016 from November 23th to 26th. Artur chaired in the UNSC dealing with the SC’s role in the Israel-Palestine Peace Process and the protection of civilians in the South Sudanese Conflict. Doreen represented Poland in the SOCHUM. Meanwhile Sven chaired the DISEC debating about threats to the international security as a cause of global drug trade and the regulation of private military contractors. 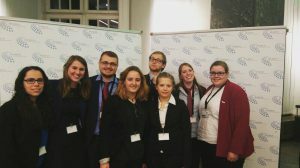 From May 4th to May 8th, a Delegation from our GöMUN society was at the EuroMUN conference in Maastricht. Our delegation was present with Imme and Duc as the double delegation of Vietnam and Anne as a chair in the ASEAN. Furthermore, Sven served as a judge in the ICJ and Artur as Finland in the European Council. Sara and Julian both represented Portugal in the ECOFIN and the NATO. Participating in the European Council of the Joint Crisis Committee was Fabian being the delegate of Spain. We are especially proud of Sven, who earned an award for the Distinguished Delegate, as well as Fabian, who earned the Best Delegate Award. On top of that our society received the award as Best Small Delegation! We were all enjoying the conference, the awesome weather and beautiful city of Maastricht. 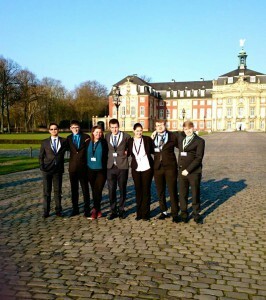 We sent a delegation to the 2016 Münster University International MUN conference at the beginning of April. Five days of interesting debates and heated discussions about changing today and shaping tomorrow lie behind our members. 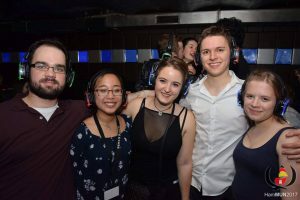 Duc, Artur and Fabian represented MUNSG in the Security Council as Great Britain, New Zealand and Venezuela. They debated about the continuous threat of ISIS and destabilization of the North African region and the new modes of warfare, international supervision and use of modern military. Ingo represented us in the DISEC and dealt successfully with global challenges regarding disarmament and issues affecting the international community in the international security administration. Topics discussed were global counter-terrorism policies and frameworks for the use of unmanned aerial vehicles. The CEPAL, as the only Spanish-speaking committee, with Doreen and Sven, tried to improve the situations in cities regarding climate change and discussed problems concerning foreign inversion and natural resources for Latin America and the Caribbean. The International Criminal Court passed a judgment on the responsibility of Mr. Noor-Irshad as an indirect perpetrator for the act of genocide in the Republic of Belair. 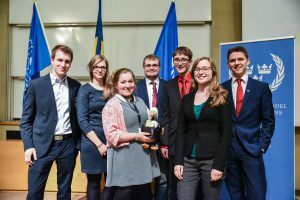 Imme as part of the prosecution represented MUNSG. We enjoyed the conference immensely and we are proud of all our delegates, especially Sven who won the Best Position Paper in the CEPAL! We hope to meet all the amazing people again soon!